Sigh. Well, I baked the bread on time…. I was thrilled and surprised that this month’s bread is not a rich and buttery confection, but Anadama Bread, a hearty bread filled with seeds. It’s perfect to go with stew on a blustery night. At least, I think it would be perfect for that. I confess that I haven’t tried it for dinner yet. But. It’s also excellent for breakfast. The story that this cornbread got its name through someone named Anna is a favorite kitchen fairy tale of New England. the origins of Anadama bread are not known, but it probably started life as a simple hoecake or ashcake of cornmeal. “Anadama” doesn’t sound much like an Indian word, but it might be Latin through English. Anadema means “wreath of flowers” or “garland” so the bread might have been a pilgrim’s harvest thanksgiving bread. Alternatively, it might be a confusion of adamantum, which is the Latin for “untameable,” a word synonymous in the seventeenth century with “diamond.” Perhaps hard-baked corn pone was like a rock! I, on the other hand, love yeasted corn bread and am really looking forward to tasting it when it has had molasses added to it. 15 December 2015, 10:17 I suddenly realized that tomorrow is (eeeeeeeeeeek!) the 16th. I’ll try to post in time; I really will. But I might be a day late. 11:23 I haven’t mixed the bread yet and will definitely be making this tomorrow. But I have a very bad feeling that I’m going to be quite late with my post. I’m so sorry for my tardy behaviour! 16 December 2015, 06:04 I was just down in the kitchen, armed with the ingredients list to get started on this bread, early for once… (errmmm, early in the day, not early for BBB deadline ) and saw that I had forgotten to write down the amount of water. I came back and saw that it isn’t listed in the ingredients list!! It only appears in the instructions. How bizarre is that? I’m guessing that Bon Appetit imagines that it isn’t necessary to write it in. I have never understood that style of recipe writing!!! Place yeast in a medium bowl or the bowl of a stand mixer. Add 1 cup warm water; stir to dissolve the yeast. Is it some ploy to force me to read?? …and retain what I’ve read? I think I need coffee to soothe my shattered nerves before getting started on this bread. Ha. Maybe I won’t be quite so early. 06:55 Why on earth is the egg listed at the bottom of the ingredients list?! Excuse me while I read through the instructions…. Brush top of dough with egg. What? I don’t think so… I’m not using up an egg for that. At $5/dozen I will be brushing the top of the loaf with a little milk. The plate-covered bowl is now in the oven with only the light turned on. I hope the dough is rising. [L]et rise in warm, draft-free spot until almost doubled in size, about 1 hour. Punch down dough to deflate; cover. Let rise again until about doubled in size, about 1 hour. 11:28 An hour, eh? Hmmm, not in this kitchen…. 13:37 Thank goodness! It looks like it has finally started to rise a little. I think I will forgo deflating the dough and letting it rise again. 18:20 What slow riser!! I imagined that I was going to be baking this late this afternoon to have it with chili con carne tonight. Ha!! I haven’t even shaped it yet. So much for being on time with this post…. 18:40 I just did the finger-poking test and saw that the dough was ready to shape. At last!! I made a round, put it seam side down on a parchment covered cookie sheet. It is now covered with a tea-towel and a plastic grocery bag, languishing in the oven with only the light turned on. Maybe it will be ready to bake after dinner…. As I was typing those last few lines, I thought I might take a last look at the instructions. Just in case…. Ooops!!! …”plus more for the pan” I was supposed to butter the pan? And then cover it with parchment? Isn’t that what the parchment is for – to eliminate the need for buttering the pan, right? What a good thing that Pat thought ahead to give me permission to skip the butter part. 19:15 And at last it’s ready to bake! Of course it is ready now… we’re just about to sit down to dinner. 20:55 I can’t believe how long it took to bake! It was almost an hour. I kept jumping up from the table to check it and finally for the last 10 minutes of baking, I didn’t even bother getting up immediately when the bell rang. After all, there was still apple crisp left in my bowl. Preheat oven to 375 degrees F. […] Bake, rotating halfway through, until bread is baked through and the top is a deep golden brown, 45-50 minutes. “45-50 minutes”? Oooops!!! I simply assumed it would take 30 minutes. Duh. But. The bread smells fabulous. Now I can’t wait for breakfast! So we had the bread for lunch. With leftover chili. Thank you, Pat! We love the bread! What a shame that I only made one loaf. Mixing the dough: In the morning of the day you will be making the bread, cut the butter into small pieces and put it into a large mixing bowl. Add cornmeal. Pour 180gm hot water overtop and mix with a wooden spoon or whisk, to melt the butter completely. Pour the rest of the still-hot water (60gm) into a small container and stir in molasses. Set aside to cool to lukewarm. Dump flours, seeds, grains and salt overtop. Make sure that the molasses water is not hotter than baby-bottle temperature (check it against the inside of your wrist: if it feels just warm or like nothing at all, it’s fine). Whisk in the yeast and pour it into the mixing bowl. Kneading (or not): Use your hands to turn and fold the dough in the bowl as many times as you feel like. Notice that it seems quite sticky. Scatter about a 1/4 cup of all-purpose flour on the board and knead it in. Congratulate yourself that NOW the dough looks and feels like dough. Put it back into the unwashed, ungreased mixing bowl (really there is no need to butter the rising bowl! ), put a plate over top and leave the dough to sit for about half an hour. Notice that after half an hour, the dough hasn’t moved at all. Turn it a couple of times in the bowl and hope that it will begin to rise soon. Comfort yourself by noting that the dough seems relatively smooth – even if there are all those seeds in it. Proofing: After 3-4 hours, notice that the dough hasn’t budged at all and laugh hysterically. With fingers crossed, put it back into oven with only the light turned on and hope for the best. Shaping: Be very disheartened that the dough has still not really doubled after almost 12 hours. Run your hands under water as you push back the tears (they’re weren’t really tears but it seems more dramatic this way) and then without drying your hands, jab an accusing finger in to the center of the dough. Be amazed and thrilled that the dough didn’t deflate and hole stayed exactly the same. Do a little dance to celebrate that it is indeed time to shape the bread. Form the dough into a ball and place it seam side down on a parchment covered cookie sheet. Cover it with a clean tea towel, followed by a plastic grocery bag and put it into the oven with only the light turned on. Imagine that you will be baking the bread to have in time for dinner. Baking: When the loaf “spring[s] back slightly when pressed” on the side, it’s ready to bake. Make sure that the rack is on the second to the top level of the oven AND that the uncooked bread is on the counter. Turn the oven to 375F to preheat. Just before putting the bread in the oven, slash it using your beautiful lame. Brush the top of the loaf liberally with milk (the BBB recipe suggests using a egg wash). Put the tray on the second shelf from the top (because of the molasses, the bottom might want to burn) and once the bread is in the oven, immediately turn the oven down to 350F (at least if you’re using our ancient oven that runs hot) and bake for 30 minutes. After 30 minutes, note that the bread is still quite blonde and not done. Bake it for 10 minutes more. And another 10 minutes. And another 10 minutes… until it sounds hollow when rapped on the bottom. 1.) Butter The BBB calls for “unsalted butter, room temperature” but I decided to use salted butter because that’s what we have in the fridge. 2.) Water You think you know what I’m going to say about the water, don’t you? Bzzzzzzt! This time, I’m not even going to repeat the cautionary note about water from the hot water tap. I’m here to exclaim that the BBB recipe inexplicably leaves water out of the list of ingredients! I have never understood that bizarre convention. It’s an error to list water as an ingredient? Especially in bread recipes, where water is one of the key ingredients! Who thinks leaving water out of the ingredients list is a good idea? And why has this idiocy being perpetuated? It’s ridiculous! 3.) Molasses The BBB recipe calls for “84gm (1/4 cup) mild-flavored molasses”. But we have a lot of blackstrap molasses in the cupboard. So I used that. And because of its stronger flavour, I used half the amount. 4.) Flour The BBB recipe calls for “250gm (2 cups) all-purpose flour, plus more for kneading, etc.” I just can’t bring myself to make anything with just white flour so I substituted some of the unbleached all-purpose with whole wheat flour. 5.) Seeds and Grains The BBB recipe calls for “2 tablespoons hemp seeds or white sesame seeds, 1 tablespoon nigella seeds or black sesame seeds, 2 tsp. golden flaxseed, 2 tsp. brown flaxseed, 2 tsp. poppy seeds”. I was lazy and decided to use the seeds and grains we already have on hand. We actually have nigella seeds but I decided I didn’t want to add a oniony flavour to the bread. So I substituted with millet that I found in the freezer when I was looking for the flaxseeds. And because I’ve heard that it’s difficult for us to digest whole flax seeds, I ground them. I also halved the amount of poppy seeds because Pat mentioned that this bread is very seedy. 8.) But I LIKE warm rolls just out of the oven!! N.B. Of course you will want to serve warm rolls. Reheat them after they have cooled completely. (They are still baking when first out of the oven!) To reheat any UNsliced bread, turn the oven to 400F for 5 minutes or so. Turn the oven OFF. Put the bread in the hot oven for ten minutes. Anadama bread is an old time bread, baked at least since 1850, particularly popular in New England, USA. This recipe is from the March 2015 Bon Appetit magazine and I like it because it adds so many seeds to the standard, but rather boring recipe of corn meal, flour, yeast, molasses and salt. […] No one really knows how this bread got its name. […] The general consensus is that a New England woman named Anna provoked her husband […who…] either threw a bag of cornmeal at her and missed, but spilled it into the dough; or he grabbed cornmeal instead of flour and tried to finish her bread. He muttered, “Anna, damn her!” […] So you can freely swear while making this bread (it’s tradition, right? ), have some wine while it rises and rises again…and again and enjoy it as the weather grows ever colder. Ha!! I knew I’d missed an important step! I forgot to have wine to go with my whine! We know you’ll want to make Anadama Bread too! To receive a Baking Buddy Badge to display on your site: make Anadama Bread in the next couple of weeks and post about it (we love to see how your bread turns out AND hear what you think about it – what you didn’t like and/or what you liked) before the 29 December 2015. If you do not have a blog, no problem; you can also post your picture(s) to Flickr (or any other photo sharing site) and record your thoughts about the bread there. Please remember to email the Kitchen of the Month to say that your post is up. I have been on the road a fair amount this month (Christmas concerts galore). For this past Sunday’s Christmas concert, I made 3 festive stars/flowers for the orchestra’s annual fundraising bake sale – many thanks again for the recipe and shaping instructions, Cathy! I THOUGHT I was making 3 small flowers to fit – with plenty of room – into large zip-lock freezer bags. For once, (of course!) I got oven spring and the bread barely fit into the bags. I was quite pleased though. About 20 minutes before the concert was to start, I went to admire the table filled with all the baking that people had brought. My bread wasn’t there!!! I tried not to panic. Blanching anyway, I asked. It turned out that all three flowers/stars had already been sold. Whoohoooo! Please remember to look at my annual Advent calendar (I know you want to, but… don’t even THINK about peeking ahead). 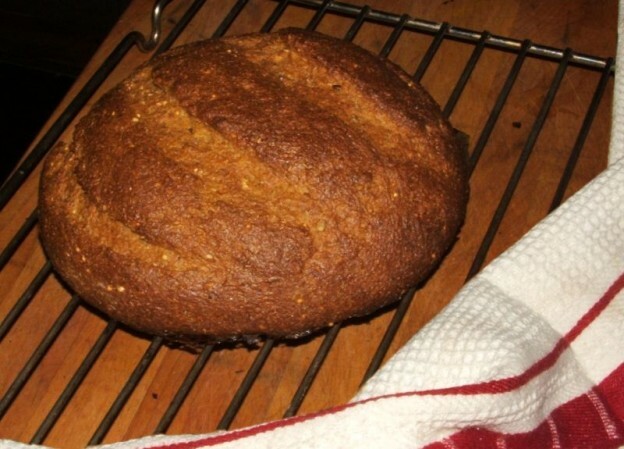 This entry was posted in baking, BBBabes, bread - yeasted & unyeasted, bread recipe, food & drink, posts with recipes on Thursday, 17 December 2015 by ejm. First off, hats off to you for making another bread after making those gorgeous snowflake breads & no wonder they sold out quickly! Second, I agree with you on the water thing…I was just giving the recipe as written (except for the permission to skip the butter, but I knew you would appreciate that) and I love that you used different seeds and millet and played with the molasses and yeast and all. Babes rule! Third, I love your bread, the shape and the height and those little millet seeds sparkling here and there. Hope you enjoy a pieced toasted with the wine. Aren’t you glad that the recipe gives permission to swear, too? I just don’t get that water thing and the fact that it is being perpetuated. I checked my go-to book on food writing (How to Write about Food: How to Become a Published Restaurant Critic, Food Journalist, Cookbook Author, and Food Blogger by S.J. Sebellin-Ross) and it says not to list water in the ingredient list. And yet I find it really interesting that on Sebellin-Ross’ website, there is at least one recipe for bread that includes water in the ingredient list: Recipe: master bread recipe from the new cookbook “The New Artisan Bread in Five Minutes a Day” (https://web.archive.org/web/20160828200914/http://www.sebellin-ross.com/cookbook-and-recipe-the-new-artisan-bread-in-five-minutes-a-day-master-bread-recipe/). Maybe since 2012, when How to Write about Food was published, Sebellin-Ross has seen the light. I love how you shaped this bread Elizabeth! Congrats on your bread sales at the concert! Wow Elizabeth! I just love your accounts of baking breads. I agree that one Anadama loaf was not enough. Congrats on selling the flower breads at the concert. What fun! I need to try that bread again myself. This is in my Heritage Cook Book and I’ve always planned on making it…. Some day….. Maybe now. Looks delicious – and congrats on selling out fast at the bake sale! Do make this, Katie! But if you only have blackstrap molasses, you might want to reduce the amount of molasses and/or substitute with honey. Again, kudos (does anyone ever say that anymore?) for making three more of those beautiful flower! Great procrastination report! This bread is not one to play with yeast, even with the amount stated mine had trouble rising. Thanks for the molasses switch, I’ll try the black treacle we brought from Scotland next. It’s always worthwhile playing with the yeast! Especially for experts like me. I’m so dissappointed… why isn’t the egg in grams too ;( hahaha you crack me up, first you reduce the amount of yeast and then you’re not happy with it’s slow rise…. take your calculator girl 1 + 1 =…. Love your loaf anyway, it’s fun to play around with the seeds and stuff, and it looks very good! Free form! Thats fabulous. I think you got a great rise using a free form shape. I am so with you on listing water in the recipe. I know it comes from the faucet and we’ve probably all paid our water bill BUT I still think it belongs on the list of ingredients. Your loaves for the concert sale were gorgeous, of course they went first! Ooooh!! I cannot wait to read this!